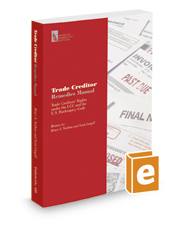 Trade Creditor Remedies Manual: Trade Creditors Rights under the UCC and the Bankruptcy Code is a comprehensive guide to understanding the remedies available under both the Uniform Commercial Code and the Bankruptcy Code to trade creditors dealing with a financially troubled customer. The manual discusses a goods seller's UCC rights to demand adequate assurance of performance from a financially shaky customer, stop delivery of its goods from an insolvent or defaulting customer, seek reclamation of its goods from an insolvent customer, and other UCC remedies prior to its customer's bankruptcy filing – including the steps creditors must carefully follow to successfully exercise these remedies. Trade Creditor Remedies Manual also explains trade creditors' rights following their customer's bankruptcy, including a goods seller's § 503(b)(9) administrative priority claim for goods sold shortly before the bankruptcy, as well as the issues that have been litigated dealing with proof of and defenses to this claim; the seller's exercise of reclamation rights; stoppage of delivery and other UCC remedies available during the bankruptcy case; and other issues unique to trade creditors. There is also a detailed discussion about the steps trade creditors should take to protect themselves when they are parties to an executory contract with a debtor in bankruptcy. The manual is filled with practical examples to help explain the legal principles discussed, and is fully annotated with citations to the most recent caselaw. It also includes form documents that can be used immediately by nearly any credit department. This is a "must have" volume for anyone in the trade credit industry and their advisors.